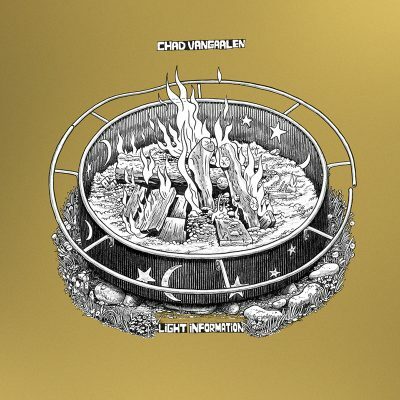 The lo-fi musings from creatively adept indie rocker Chad VanGaalen are on full display inside his latest album, Light Information. Like much of VanGaalen’s catalog, this most recent offering sounds as though he crafted it all himself and polished and packaged it in his bedroom yesterday, but in a good way. It’s as though inspiration kicked him from a number of different angles all at once and, being gifted with ingenuities abound, VanGaalen was able to simultaneously focus on every aspect of the album long enough to capture it. This record is busy and loud, but a bit quiet, too—there is a lot going on. I have to assume that VanGaalen’s iTunes library is gigantic. I would guess that most musicians’ collections are, but his specifically. There were so many touches on this album that sounded familiar, yet simultaneously, I couldn’t nail most of them down. I ended up comparing what I was listening to with some seriously eclectic possibilities and combinations. The first track, my favorite, is “Mind Hijacker’s Game.” It brings a sense of urgency through the speakers, like it may be signifying something huge is on its way. It was a blend of the scene from Silence of the Lambs with the wicked Q Lazzarus song and the first time I ever heard Arcade Fire. Odd, I know, but VanGaalen fits that bill. The album is littered with such songs, evoking similar visuals in my mind. At times, I pondered if I could be hearing Neil Young through a vocoder, playing with a drum machine, or Brian Wilson in charge of production for a psychedelic Peter, Bjorn and John album, insisting he continue to add new, unknown features to Phil Spektor’s wall of sound. I know this all might sound like a lot about a lot, but that is the best I can do when describing Light Information. There is nothing light about the information listeners will be processing during the 39-minute run time, which is just about right when I consider the various directions VanGaalen will take them in. And, I feel, the resulting interpretations will be all over the map—which is good: It means that this album will appeal to an awfully large crowd, all in the same place looking for something entirely different, and most will leave totally satisfied. There are a handful of very good singles here, thick with fun, thoughtful musicianship. The instruments, the melodies and the lyrics all combine for a pleasant experience. The songs in between the best ones are also good—I just need more time with them. I’ve never fallen in love with every track on an album within a couple of weeks of listening to it. I have to get tired of the songs I like the most before I begin skipping them for others, and right now, I am happy playing Light Information’s gems over and over again.